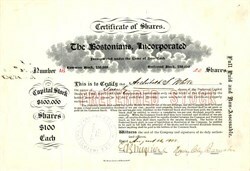 Beautiful RARE stock certificate from The Bostonians, Incorporated issued in 1903. This historic document was printed by the Broun-Green Company and has a vignette of the company's name. This item has the handsigned signatures of the Company’s President, Henry Clay Barnabee and Treasurer, Emil Burguiere and is over 108 years old. Issued to and endorsed on the back by Archibald S. White. The Bostonians began life in 1879 as the Boston Ideal Opera Company, founded by Effie H. Ober specifically for an American production of Gilbert and Sullivan's H.M.S. Pinafore. The group officially became the Bostonians after a bit of an internal administration skirmish, with William H. MacDonald, Tom Karl and Henry Clay Barnabee rising to lead the group. Barnabee, the bass-baritone who sang the role of Sir Joseph Porter in Pinafore, served as the first actor/manager of the "new" organization. Barnabee would remain with the group until their demise in 1904. The venerable Bostonians had little major competition prior to 1898. Dedicated to the presentation of "light" opera with excellent voices, good acting, and high production values, the company toured the United States from coast to coast, as well as Canada, playing every important city in both countries for 12 years. They were one of the first "national" touring companies, often playing some cities (San Francisco, Chicago, New York, etc.) for weeks at a time. Barnabee, a dry goods salesman, made his professional debut in a recital at the Music Hall in Boston in 1865, but his fame as a soloist and performer in musical theatre remained largely local until 1879 when he became involved with the Bostonians. His greatest role was the Sheriff of Nottingham in Reginald De Koven's Robin Hood (1891), which he created and played in every single incarnation. One of Barnabee's most important contributions to both the Bostonians and the American musical theatre was his decision to commission American operettas, actually beginning with works by Reginald De Koven (Robin Hood in particular) and then, Victor Herbert. The Herbert commissions included Prince Ananias (1894), The Serenade (1897) and The Viceroy (1900). The Bostonians' commission of Herbert's The Serenade (1897) was the most well received, but managed to rend The Bostonians company in two as Alice Nielsen, a fairly new, young and beautiful member of the company, pulled away from the group after this production, and formed the Alice Nielsen Opera Company, one of the aforementioned first significant challenges to the Bostonians. Here was a classic case of a dazzlingly talented newcomer incurring the disfavor of the long established Bostonians leading lady, Jessie Bartlett Davis. The rise of Alice was due to boldness, tremendous vocal abilities and the assistance of both Mr. and Mrs. Herbert. While the production may be considered Herbert's first real masterpiece, it ended up causing such a major shift in the company roster after its completion that it is probably safe to say the Bostonians never fully recovered. We'll look at more details of this relatively shocking turn of events when we shine The Spotlight On . . . The Serenade and The Fortune Teller in a few months. Neither Prince Ananias nor The Viceroy had the success of The Serenade. De Koven's Robin Hood remained the company's greatest success, running up a total of nearly 2000 performances! After The Viceroy in April of 1900, Victor Herbert stopped writing operettas until the 1903 master piece, Babes In Toyland. This marked the longest drought in his operetta composing history. He certainly did not stop composing, but focused his efforts almost totally for the Pittsburgh Orchestra until 1904. There was one other little item that took up a tremendous amount of time and effort for Herbert. From 1901 to 1903, the composer found himself involved in a libel suit against a New York City magazine, The Musical Courier, or more specifically, its editor Marc A. Blumenberg. He won, but the resulting trial took a large amount of time and energy, most likely adding to the composer's time away from operetta composing. The case was not totally closed until 1905. The year 1904 also marked the end of Herbert's term as musical director/conductor of the Pittsburgh Orchestra in the Spring and the birth of the Victor Herbert Orchestra in the Fall in New York City. By the time Herbert returned to composing for the theatre in 1903, the stalwart Bostonians were close to ending their storied existence, finally exiting the theatre world after the 1904-05 season. In September 2003, Richard Conrad started a new group called The Bostonians. The Bostonian Opera and Concert Ensemble's website is located at http://www.thebostonians.org/artisticdirector.html. Barnabee, Henry Clay (1833–1917), comic actor and singer. Born in Jamaica Plains, Massachusetts, he quit school to work as a dry‐goods clerk, but performing in amateur theatricals convinced him his future lay in performing. Barnaby made his professional debut in recital at the Music Hall in Boston in 1865, but his fame as a soloist and as a performer in musical theatre remained largely local until 1879 when he became one of the original members of the Boston Ideal Opera Company. He stayed with the “Bostonians” for their quarter‐century history, serving as their principal comedian. While he was hailed for such interpretations as Sir Joseph Porter in H. M. S. Pinafore, Bunthorne in Patience, Izzet Pasha in Fatinitza, Dulcamara in The Elixir of Love, and Lord Allcash in Fra Diavolo, his greatest role was the Sheriff of Nottingham in Robin Hood (1891), which he created and played for some two thousand times. The horse‐faced performer was appreciated for his rare combination of fine bass‐baritone singing and humor, one Kansas City critic noting, “At all times he is a gentleman, and nothing in his quiet and Jeffersonian wit is ever vulgar or out of place.” Autobiography: My Wanderings, 1913. Henry Clay Barnabee 1833-1917 One of the great comedians of the 19th century. Henry Clay Barnabee, was a comedians comedian. His career did span a true lifetime. He was great singer, performer, and most of all, a friend of the theater. He was a member of all the major theatrical groups. He was the founder the Bostonians, a performing group that worked all over the country for 25 years. 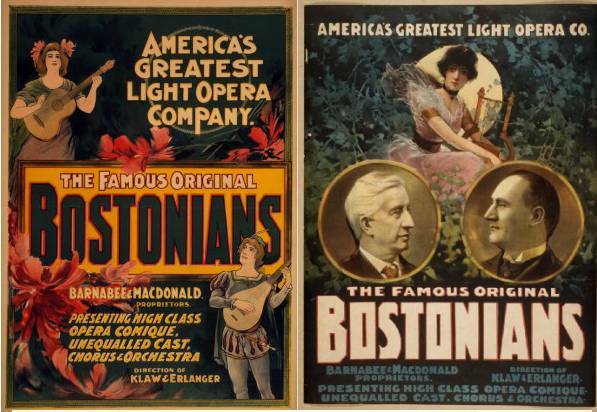 The Bostonian's Incorporated," by its president The corporation was engaged in giving operatic performances. Its principal office was in the city of New York at the office of Loudon G. Carleton .